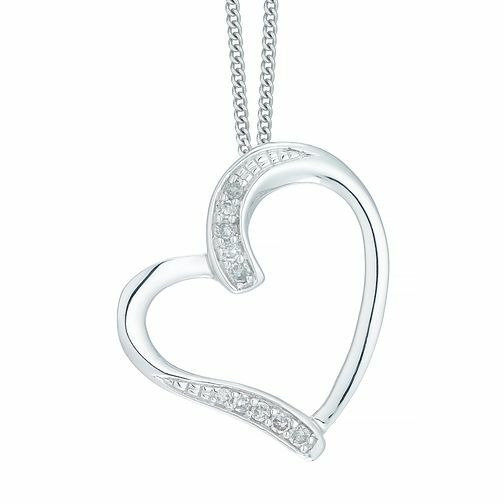 Set on a feminine fine chain, this shining 9ct white gold open heart pendant is set with delicately dazzling diamonds for a light-loving look. 9ct White Gold Diamond Heart Pendant is rated 4.7 out of 5 by 12. Rated 5 out of 5 by Anonymous from 9ct white gold open heart pendant Beautiful piece, simple design with an elegant chain. Rated 5 out of 5 by Anonymous from A lovely necklace I was given this beautiful, delicate necklace a couple of years ago as a gift so when it was stolen whilst in holiday I was devastated. Insurance came through and I loved this necklace so much I purchased the exact same one again.